We all want to meet people from history. The trouble is, everyone is dead! Fear not, Horrible Histories can bring them to life for you and your family. 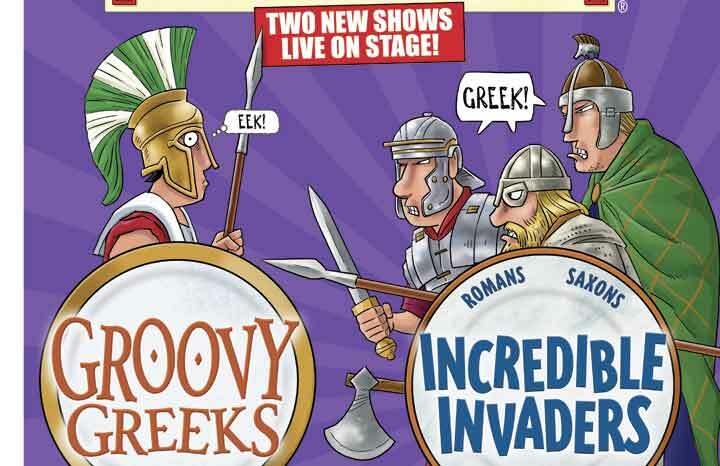 Our winners can choose between two new shows – Groovy Greeks and Incredible Invaders – which are guaranteed to thrill you and your children. Historical figures and events will come alive on stage and hover at your fingertips! Coming to a venue near you in 2015! First prize is a family ticket plus Horrible Histories merchandise, plus five runners-up will win a family ticket! • Not a winner? Visit www.birminghamstage.com or www.barmybritain.com for more information on tour venues and dates. T&Cs: Prize based on a family of four with a minimum of one adult and one child. Valid for all performances at all venues excluding Saturday matinees until Dec 5, 2015. Subject to availability. Win tickets to see a West End play! Win a weekend break for you and your family to see Barmy Britain Part Three!